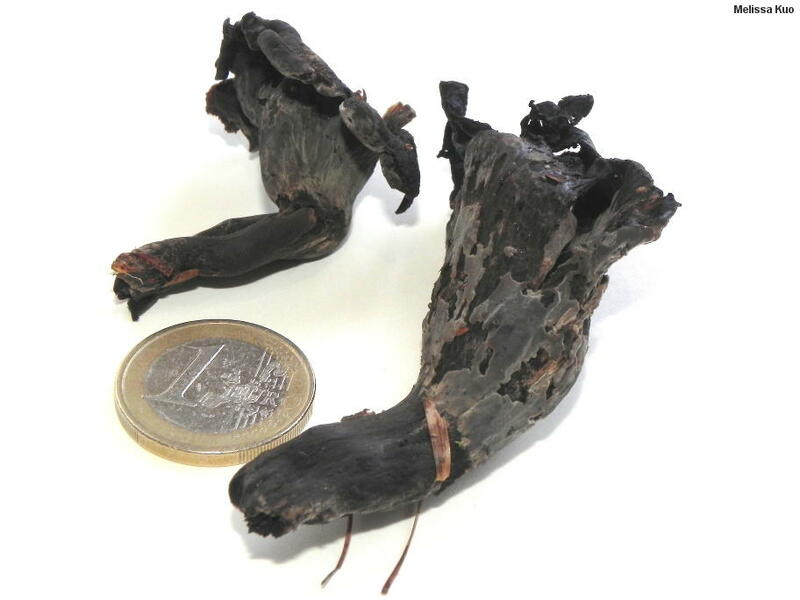 This classic European species was first named and described by Linnaeus (1753), and is often called the "black trumpet" in English, or trompette de la mort in French. It is deeply vase-shaped, and its surfaces are dark gray to black. As the mushrooms mature, the outer surfaces develop a whitish to cream-colored sheen, resulting from the maturation of spores. Recent research by Matheny and collaborators (2010) supports the idea that Craterellus cornucopioides does not occur in North America, where it is replaced by Craterellus fallax in eastern North America, and a probably as-yet unnamed species (Craterellus species 01) on the West Coast. 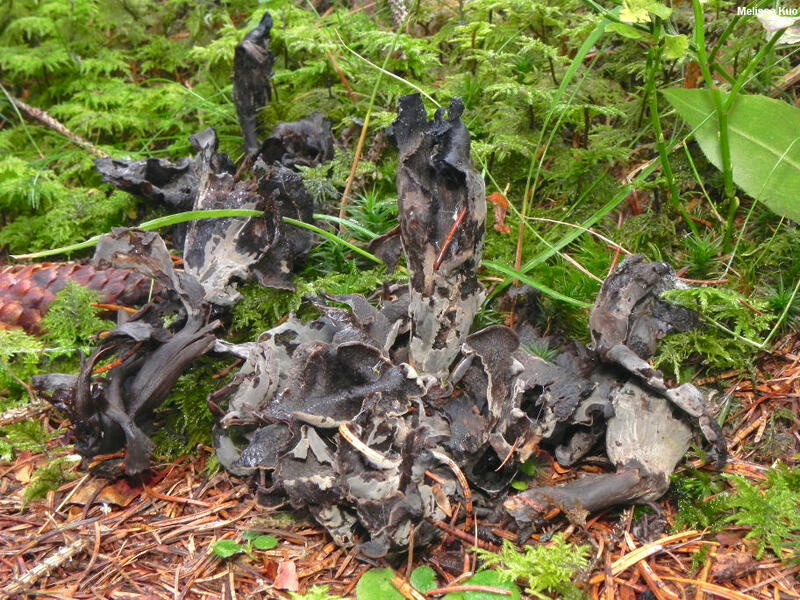 The genetic difference between Craterellus cornucopioides and Craterellus fallax is paralleled by a morphological difference (which is good news for those who get lost and don't know which continent they're standing on): the spore print of the former is white to creamy, while the latter species has a pinkish yellow spore print. Ecology: Mycorrhizal with hardwoods and, less frequently, with conifers; growing scattered, gregariously, or (usually) in tightly packed clusters, often in mossy areas; summer and fall; widely distributed in Europe. The illustrated and described collection is from northern Italy. 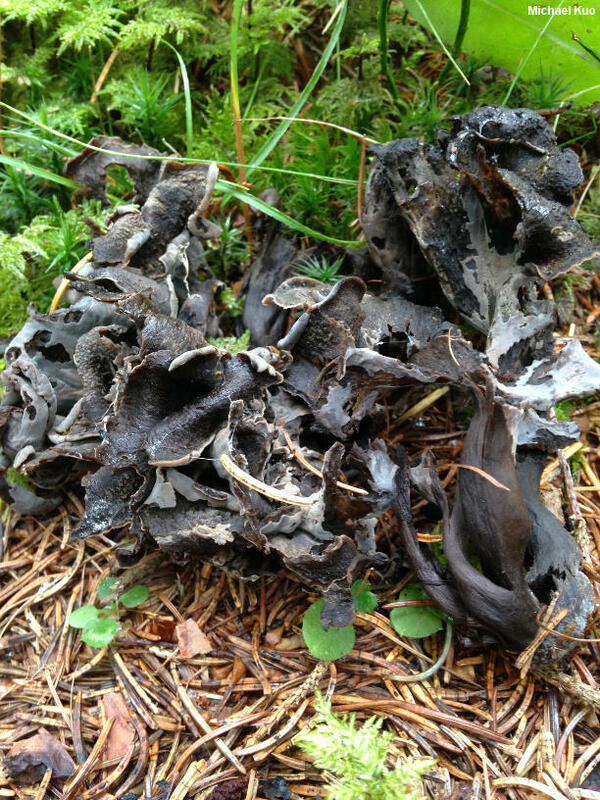 Fruiting Body: 3-5 cm wide; 5-9 cm high; without a clearly defined cap and stem; tubular at first, becoming deeply vase-shaped; the upper edge rolled under when young and often partly rolled under in maturity; thin-fleshed. Upper/Inner Surface: Black to dark gray; finely roughened or finely scaly with dark fibers and scales over a paler, grayish or grayish brown base color. Under/Outer Surface: Smooth or very shallowly wrinkled; dark gray to black, with a whitish bloom. Flesh: Thin and brittle; blackish. Odor and Taste: Taste mild; odor not distinctive, or somewhat sweet and fragrant. Microscopic Features: Spores 11-14 x 7-9 µ broadly ellipsoid; smooth; hyaline and uniguttulate in KOH. Basidia to 75 µ long; 2-sterigmate. 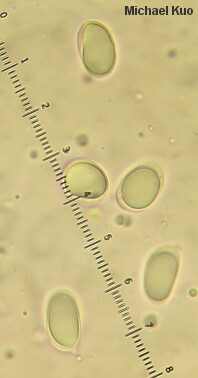 Elements of upper surface cylindric; septate; hyaline to brownish; 5-20 µ wide. Clamp connections absent. REFERENCES: (Linnaeus, 1753) Persoon, 1825 (Fries, 1821; Saccardo, 1888; Corner, 1966; Phillips, 1981; Breitenbach & Kränzlin, 1986; Dahlman et al., 2000; Kibby, 2006; Nonis, 2007; Matheny et al., 2010.) Herb. Kuo 10111401.